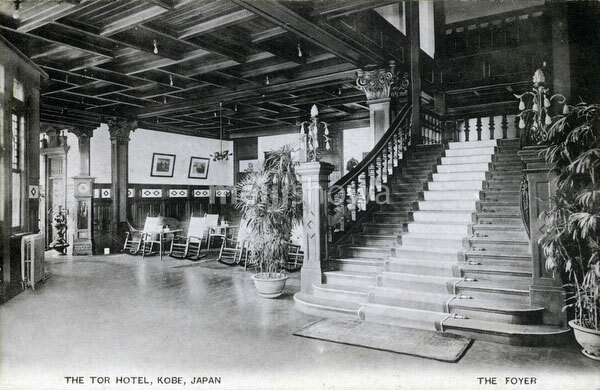 The entrance hall of the Tor Hotel in Kobe, Hyogo Prefecture. The Tor Hotel was located on the northern end of Kobe’s Tor Road, now the location of the Kobe Club. The hotel was built in 1908 (Meiji 41) because the popular Oriental Hotel near the port was overcrowded each time passenger ships arrived. The hotel received its name from it location, a rocky hill or “tor”. Soon people started to call the road leading to it “Tor road.” The hotel burned down shortly after the end of WWII, but the road has kept its name. Larger sizes available. Contact Us! Boutique photo agency for vintage photographs, illustrations and maps of Japan between the 1860s and 1930s (Meiji, Taisho, early Showa). Use meijishowa images for news, documentaries, articles, books, advertising, exhibits, and more. PRIVATE COLLECTION — Many of our images are extremely rare and can often not be licensed anywhere else.